I am trying so hard to make main courses instead of just desserts, but it is so hard for me! I love to make desserts! 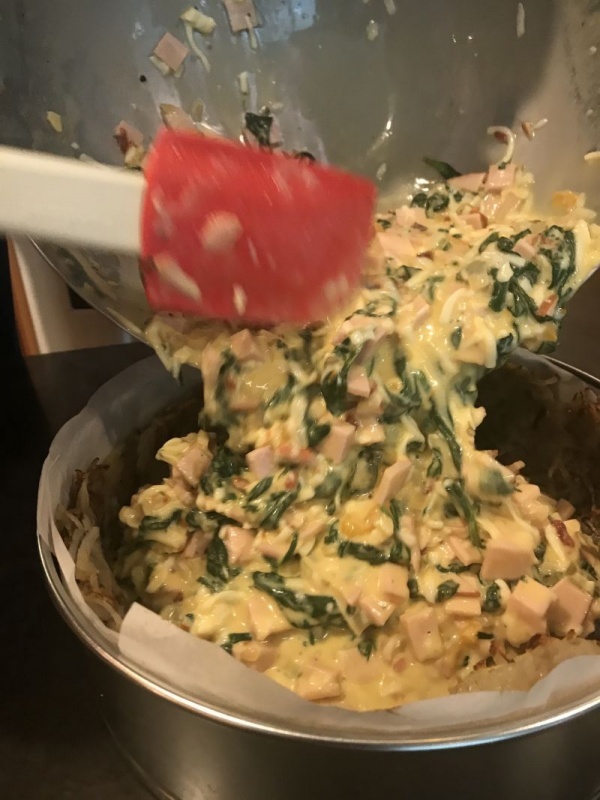 Amber will start fussing at me if I make too many sweets, so this week I have a wonderful quiche for you that doesn’t use a flour crust! 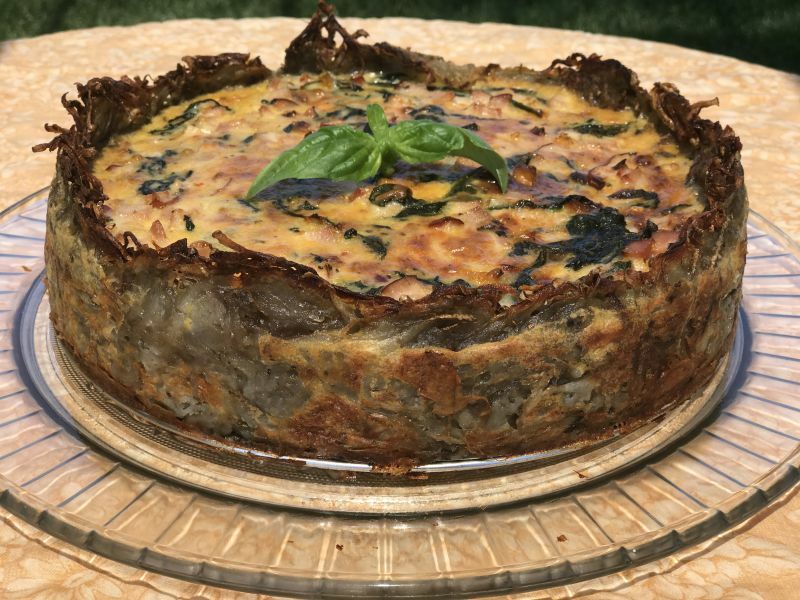 It’s a Canadian Bacon and Spinach Quiche with a potato crust. It’s so pretty, and I feel like I channeled my inner Julia Child with this one. In addition, it’s Gluten Free! 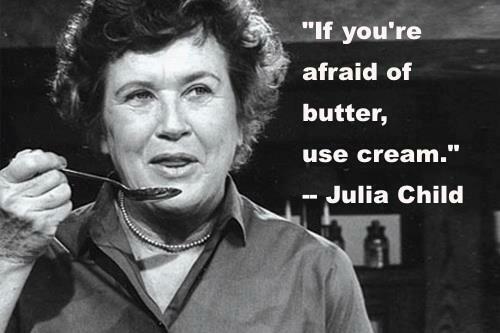 Don’t you just love Julia? Remember last week when I said you need to have a roll of parchment paper on hand? This one uses parchment paper also, so either dig it out or run to the market and get a roll! We are also going to use a spring-form pan, and while cleaning my garage cabinets I found that I have a total of 9 of them in various sizes. Please don’t tell my husband; he’ll make me get rid of some! The recipe is so fabulous a broke out a brand new set of spring-form pans for it! They are so shiny and new I almost hate to use them! 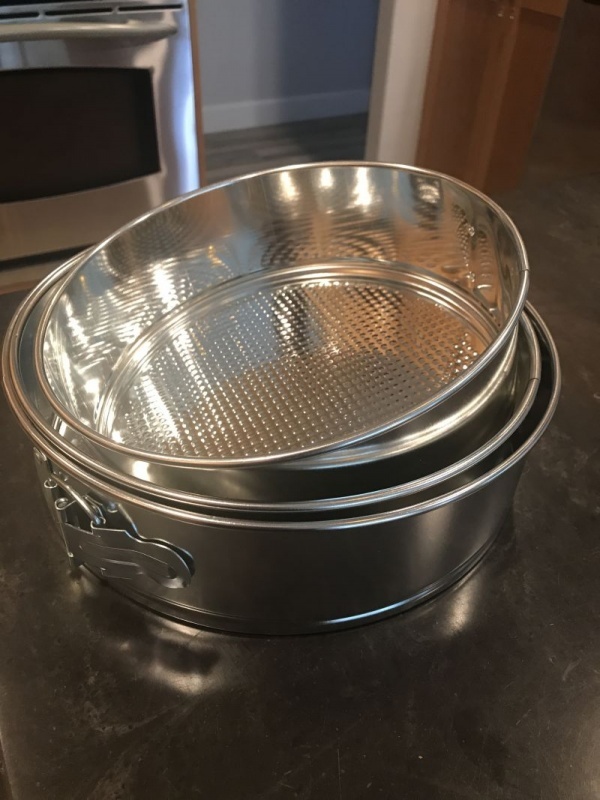 Look how shiny these new pans are! 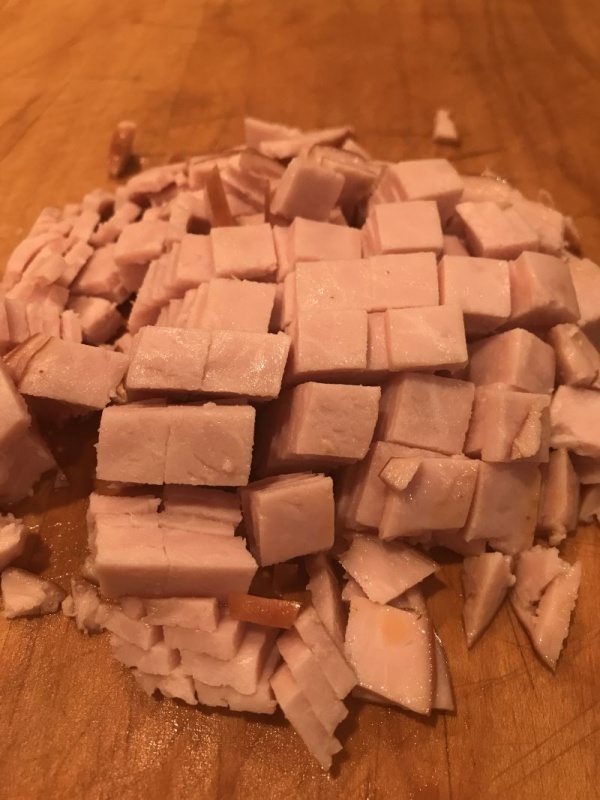 You’re going to need a grater for this one, and if you have a food processor with a grating attachment, that will be perfect. Let’s get to it because as I write this up, this recipe is actually in the oven cooking and the smell is driving me nuts! I can’t wait for it to come out of the oven! 2 LARGE baking potatoes, grated. No need to peel. 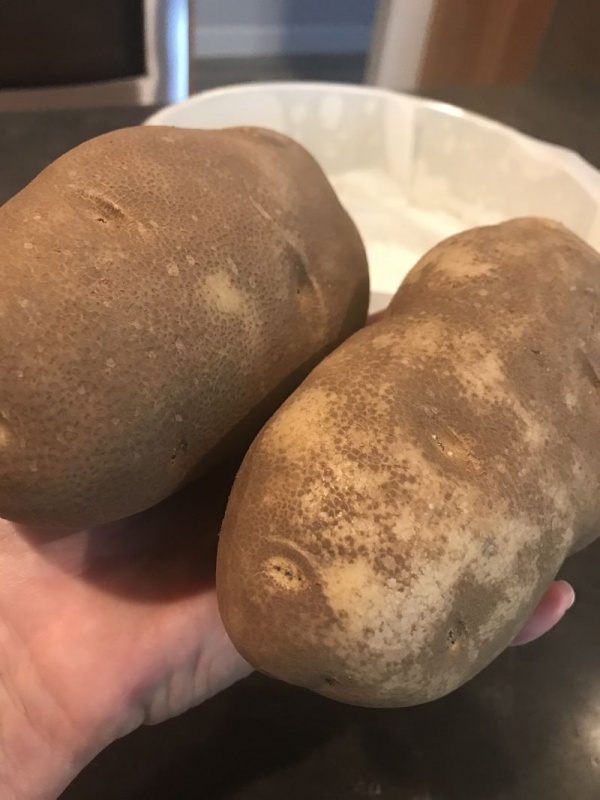 These potatoes already look good just as they cook! 1. 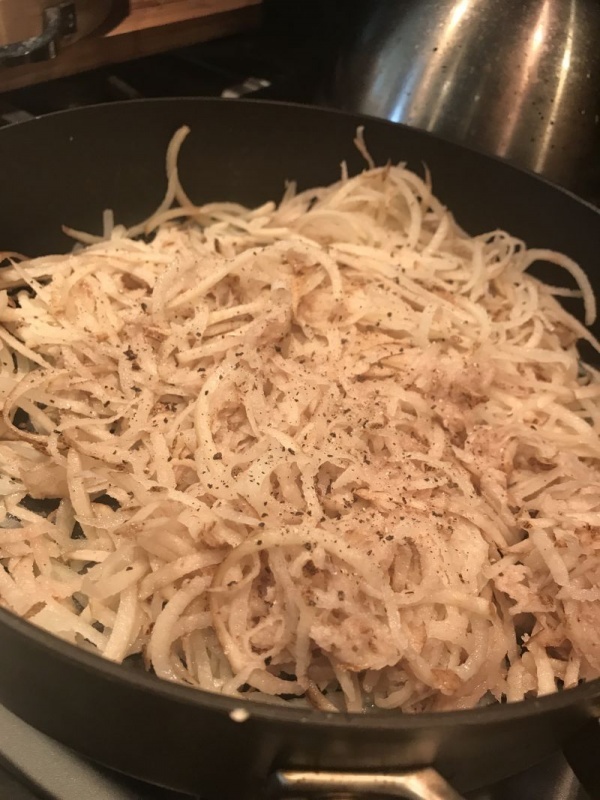 Place a little oil in a skillet on med-high heat, and toss in the grated potatoes. Your objective is to get a little brown color on them, not to cook them all the way through. Sprinkle a little salt and pepper on them as they cook. They should have crispy parts. Remove to a bowl to cool, as you will handle them with your hands. It should take two batches to cook all those potatoes! Not only does the parchment paper keep your food from sticking, but it makes easy clean up! 2. While the potatoes are cooling, coat the inside of the spring-form pan with oil and line with parchment. (simply trace the shape on the parchment and cut it out, and cut strips of parchment for the sides. Brush the parchment with oil when you are finished. 3. Using your hands, press the warm potatoes on the bottom of the springform pan as you would a graham cracker crust. Because the potatoes are not totally cooked, they will be a bit sticky and gooey from the starch content. This is what holds it all together. Press the potatoes up the side as well. 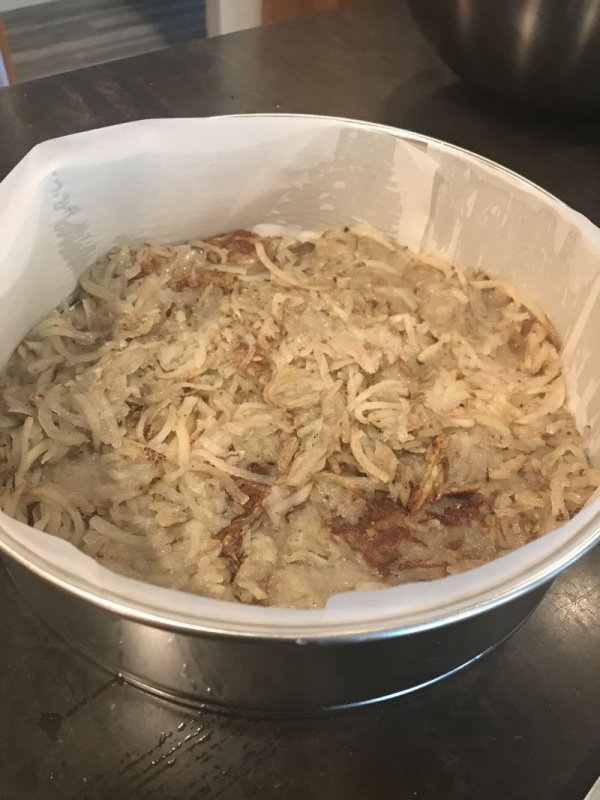 If you have a hard time keeping the potatoes on the sides of the pan, fold a long piece of foil into a band and place along the inside of the pan against the potatoes. This will hold them up while it cooks if needed. 4. Place in a preheated 400-degree oven for 25 minutes. 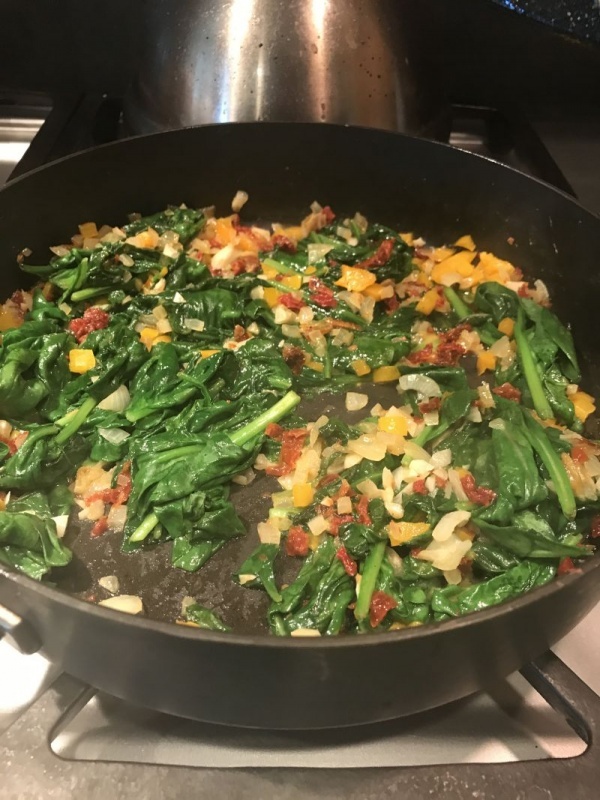 Spinach wilts down when cooked. 5. Using the same skillet you used for the potatoes (no need to wash it) melt the butter, and over medium heat sauté the peppers, onions, sun-dried tomatoes and garlic. Sauté until tender. 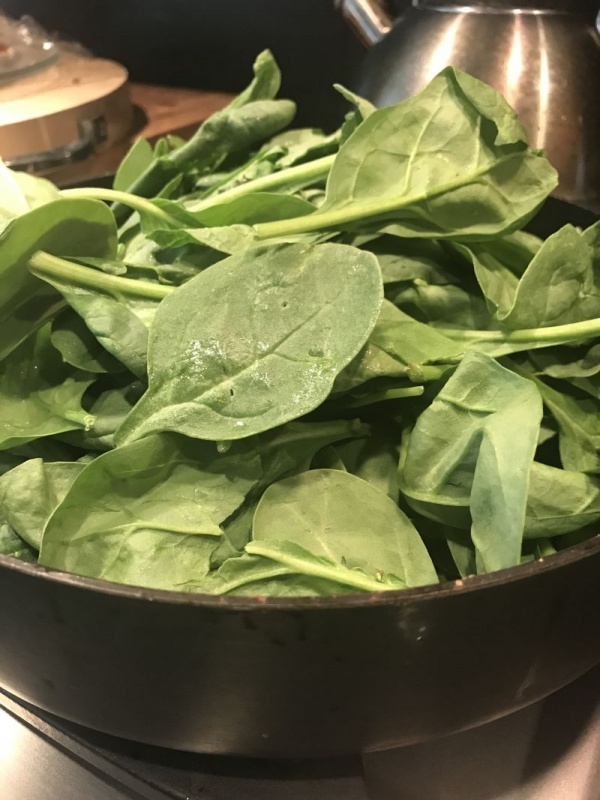 Fresh spinach is so healthy. Fresh is always best! 6. Add the entire bag of spinach leaves. It will look like it won’t fit, but the spinach leaves shrink down as they cook. (See the photos). Once cooked, turn off the heat and set aside to slightly cool. 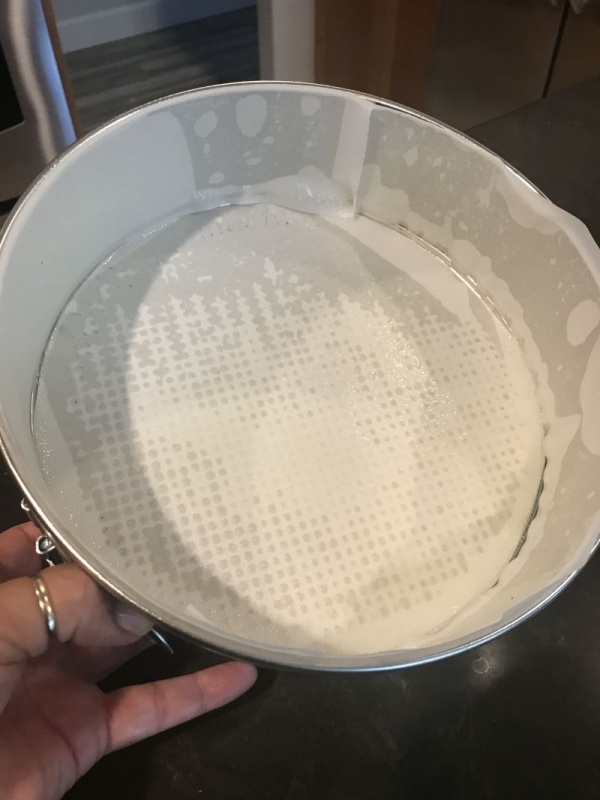 You can see how rich and creamy the batter looks. 7. 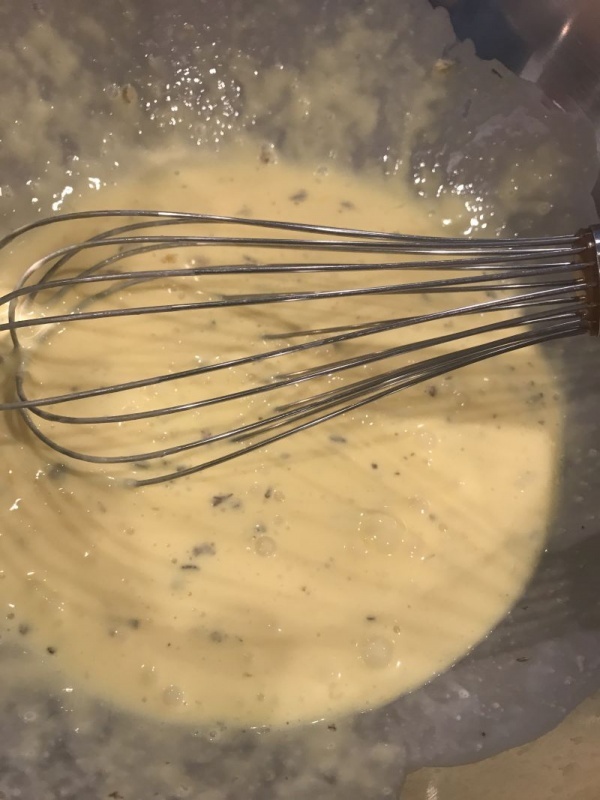 In a large bowl, whisk together the milk, eggs and Italian seasoning. Add the grated cheese, the diced Canadian bacon and the sautéed vegetables. Fold together with a rubber spatula. Pour the batter carefully onto the crust. 8. Spoon your egg and vegetable mixture into your baked potato crust and return to the oven for 45 minutes. (If you used foil to support the sides while cooking, make sure you remove it first!) You can make sure it is done by sticking a sharp knife in the center; if it comes out clean (without wet egg mixture on it) it is done! If the knife comes out gooey, cook for 10 more minutes. Place into the oven and bake – I cant wait to have a slice. 9. Place on a pretty plate, and remove the spring-form sides to serve. Peel the parchment from the sides. 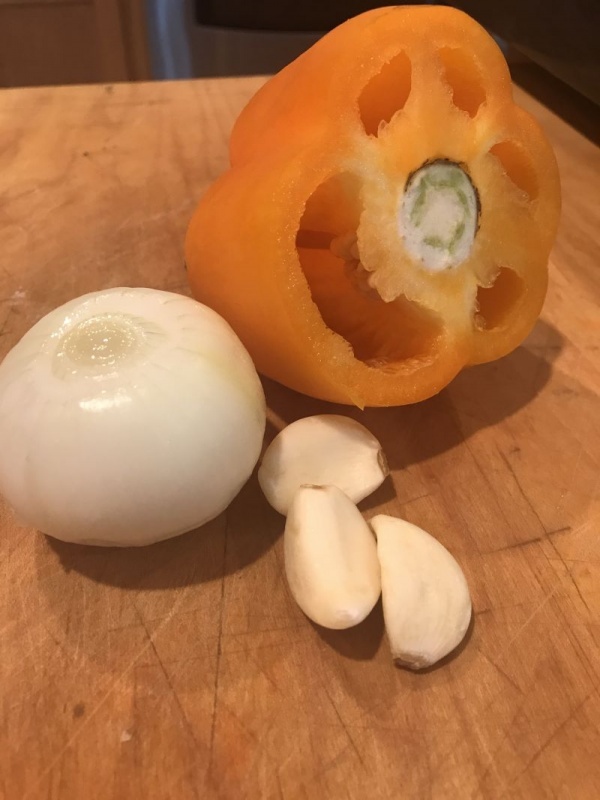 Cut into slices like a pie, and serve. Finished product. Look how delicious it looks! This is so pretty served with a little salad and makes a lovely lunch or dinner. 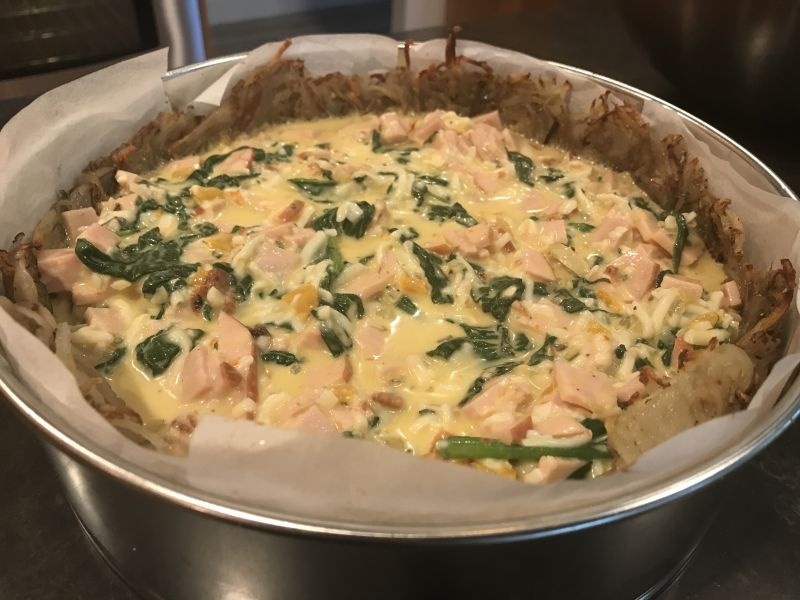 I love spinach quiche!!! So yummy! I can eat it all day long! 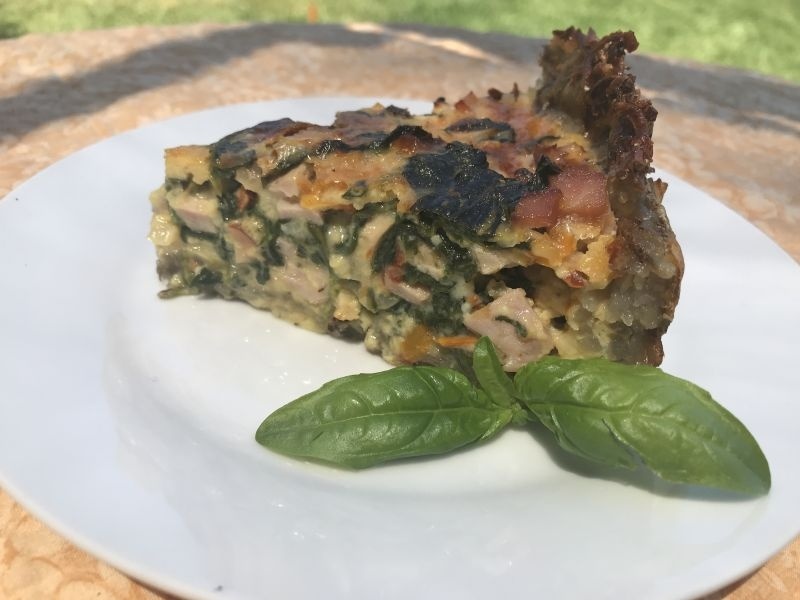 I love the lightness of quiche in the summertime. And the potato crust is a great idea!